Sony NW-ZX100HN review | What Hi-Fi? The Sony NW-ZX100HN is the hidden gem of the Walkman range. At £500, this high-resolution music player sits right in between the Sony NW-A25HN (an affordable music player at £250) and the flagship NW-ZX2 (£900). It offers the best of both worlds: the excellent features of the flagship coupled with the slim design and simple interface of the budget version. Sony has plenty of tricks up its sleeve with the NW-ZX100, from its new, slimmer body, to the extensive playback support (from MP3s to 24-bit/192kHz resolution and DSD files), and built-in noise-cancelling. The notes sound pristine, and sparkle without sounding harsh or bright at any point. Imogen Heap’s voice on Lifeline (in 24-bit/96kHz) comes through clear and centred. Detail is abundant. Harmonies are easy to pick out, and instruments are easy to place in a rather spacious soundfield. Basslines are taut and nimble, but not as deep and rumbling as when played on the Award-winning Astell & Kern AK Jr. The £400 music player is the NW-ZX100’s main rival, and it has a tad more subtlety, depth and punch compared with the Sony. The Sony player isn’t quite as meaty, nor does it go as powerful and loud as the Astell. We’d like more dynamism to songs, too. But that lack of weight does mean songs like Public Service Broadcasting’s Gagarin are delivered in a pacy manner. The NW-ZX100 is perhaps a touch too polite. You can hear every inflection, every plosive, every intake of breath when Adele’s Hello is playing on the Astell & Kern. The Sony holds back a bit, not revealing every last detail or letting songs soar and dip with utter conviction. It may not be as gripping and expressive as the AK Jr, but it is an enjoyable listen overall. As with most Walkmans, the player is equipped with Sony’s DSEE HX sound processing. This tries to make up for the inherent shortcomings of such recordings by giving them a bit more openness and punch, although we’d steer clear of the ClearAudio+ setting, as it doesn’t do voices any favours and adds a steely edge to the proceedings. The NW-ZX100 comes with a pair of in-ear headphones, which work nicely with the player’s built-in noise-cancelling. There are different noise-cancelling settings for the environment you’re in (office, airplane, public transport, auto), all of which deliver a very subtle – almost too subtle – effect. The headphones themselves offer an element of noise-isolation, and have a rounded, clean delivery. We’d update to a pair of AKG Y50s or Sennhieser Momentum In-ears if you want a more revealing and crisp sound, though. The NW-ZX100’s design is clearly influenced by the flagship NW-ZX2, but with lots of little amendments to make it easier to use. That bulge which accommodates the headphone jack? Instead of jutting out oddly, it now sits flush with the back of the device. The bottom end of the ZX100 remains rather chunky, but it’s a much more compact and lightweight device than the ZX2. The ZX100’s slimmer width and curved design means it fits snugly in the palm of your hand, and the textured rubber on the back panel helps keep a firm grip. 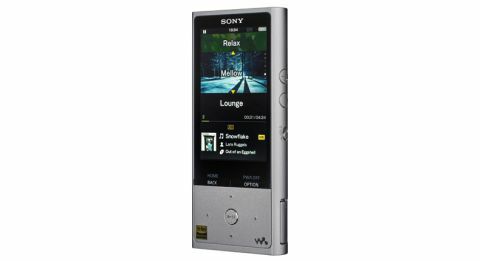 Unlike the plain black of the ZX2, the ZX100 comes in a textured silver finish that sets it apart from the rest of the Walkman family. It’s quite eye-catching. One glaring difference is that the ZX100 doesn’t have a touchscreen display. It doesn’t even have an Android interface – which may be a godsend to some, or a bit of a letdown for others. If you’re used to a smartphone, the lack of touchscreen might throw you at first. We kept swiping and prodding at the 3in TFT screen until we realised that this Walkman uses good old-fashioned buttons. Playback controls, option and back buttons are all closely placed together, making them fairly easy to reach with your thumb. It’s comfortable to use with just one hand, too. The buttons become second nature after a while, but our main complaint is that they lack the quality feel a £500 player should have. In fact, they feel pretty much exactly the same as the ones on the more affordable Walkman NW-A25HN. We’d be much happier if they were built like the ZX100’s volume buttons: round, solid, sturdy and satisfying to press. They’re joined on the side by a hold button (that locks the screen and controls), and a microSD card slot for expanding the internal 32GB storage. Since it’s not run on an Android operating system, the ZX100 uses a stock version of Sony Walkman’s software – it’s a simple, logical layout of subfolders. The one downside of this is that you can’t download streaming services such as Tidal, Spotify or Deezer via the Google Play Store, nor will you be able to access hi-res download stores. Still, it keeps it neat as a standalone music player without the distractions of an Android interface. The screen may be small, but it has a good contrast with legible writing, and can pack in a lot of information without looking too cluttered. There’s even room for album art, which adds more dynamism and colour to a long list of songs and album names. The player doesn’t display sampling rate, bit depth or file size at a glance on such a small screen. You’ll have to delve into the options menu to get more detailed information on each track. The Sony ZX100 also features aptX Bluetooth streaming and one-tap NFC. Being Sony, it uses its own LDAC codec for streaming higher quality songs wirelessly to compatible Sony speakers, but Bluetooth applies if you’re pairing with speakers from other brands. Our sample connected without a hitch to a pair of Ruark MR1 speakers, and the stream was steady and uninterrupted. The Sony’s battery lasts for a commendable 45 hours if you’re playing hi-res FLAC files continuously (or 70 hours if you’re playing MP3s). We played a mixture of song files and only had to charge it up once when testing over a full week – you don’t get that with fancy smartphones. It may not be a perfect player, but this hi-res Walkman joins our Award-winning Astell & Kern AK Jr and the Pioneer XDP-100R in a fast-growing category of portables that deliver great-sounding hi-res music. The Sony NW-ZX100 is a competent and enjoyable player. We like the slim design and its ease of use. And at £500, it hits the sweet spot at being an affordable player that offers a touch of premium quality.